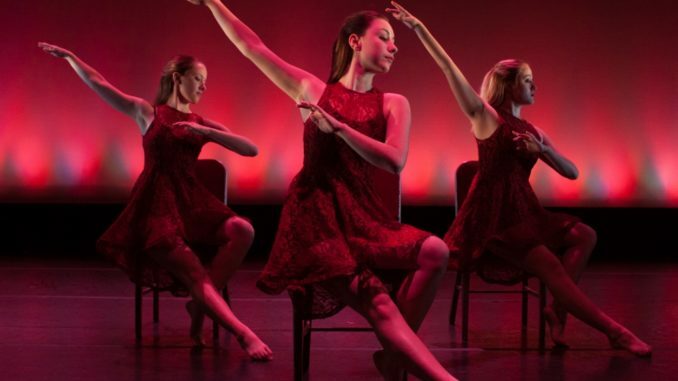 Modern, hip-hop, jazz and tap dance, all of the hours of hard work have paid off for Wittenberg’s dancers who got the opportunity to showcase their talents in a variety of ways at the 33rd annual Fall Dance Concert. Over 25 student dancers performed 16 pieces for the concert that took place Nov. 9-12 at Chakeres Memorial Theater. Directed by Shih-Ming Li Chang, associate professor of dance, many of the songs dancers performed to ranged from “End of Time” by Beyoncé to “Despacitpo” by 2Cellos. Students choreographing the pieces is a unique feature for Wittenberg’s dance program. Planning for the concert and dances begin early because it requires a lot of time, organization, creativity and vision to pull together a show as successful and popular as the fall dance concert. Overall, there were 15 different choreographers who held auditions and then selected the dancers that they would like to have participate in their piece and then held practices once a week. The last week dancers have up/downs, where they have a half hour practice every day for each piece. Finally, they have three dress rehearsals the week before preforming four sold out shows to members of the Wittenberg community. Spin after spin, twirl after twirl and dance after dance, the enthusiastic crowd let the dancers know that they were doing a great job with cheers, applause and encouraging words shouted in between performances. The eruption of excitement that came from the audience following the performance of “Ambiguous,” choreographed by Abby Cannon, ’18, made it clear that this was the crowd’s favorite dance on opening night. The nine dancers put on a beautiful display of passion that showed off the modern style of dance. The piece had a unique moment where four of the dancers came together to create a human latter that allowed another dancer to climb to the top and leave the audiences’ jaws on the floor. The next dance that seemed to be a crowd favorite was “In The Eyes,” choreographed by Rachael Fink, ’20. The audience couldn’t contain their enthusiasm as you could hear “That’s my girlfriend” and “I’m so proud of you” shouted across the theatre. The excitement then carried over the to next dance choreographed by Collin Sparks, ’18, that that showed off how magnificent tap dancing truly is. The conclusion of the piece was meet with cheers like “I’m dating him too” and “that’s my roommate” from the audience. Although the Fall Dance Concert has come to a conclusion, the bonds that were created will stay with these dancers and make for an even better show in the spring. To stay up-to-date on upcoming events, like the short play festival, you can follow the Wittenberg University Theatre and Dance department at @wittheatredance on Facebook and Instagram.